What does a professional chef dream about when she gets to build a brand-new home kitchen? For Alex Guarnaschelli, it was light—loads of it. 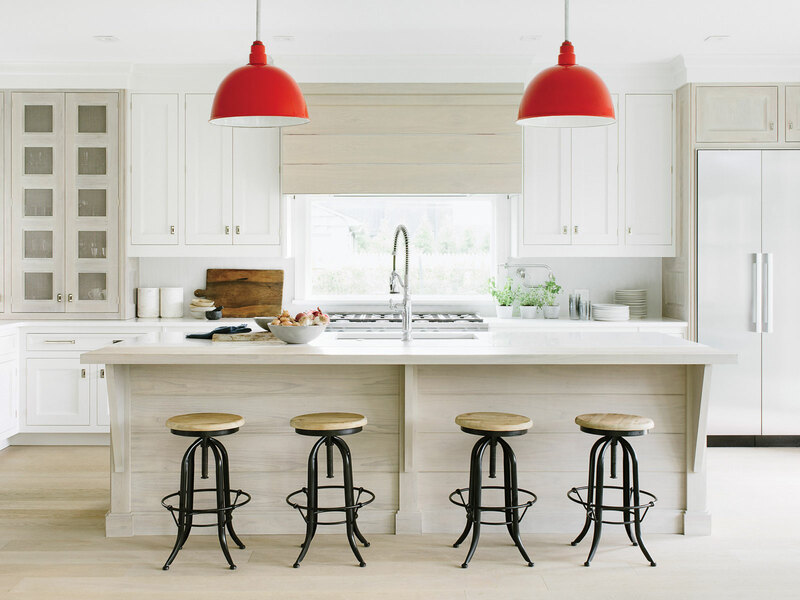 Guarnaschelli recently finished an extensive renovation of her 1925 bungalow-style farmhouse in Bridgehampton, New York. In addition to light, Guarnaschelli wanted her kitchen to feature a big, picturesque window right over the stove. Now, when Guarnaschelli cooks, she looks out on her garden and can see the weather—rain or shine. She wanted the kitchen and dining area to be modern and empty—a decision that Guarnaschelli stands by, though her designers were skeptical. “The space bullies are after me!” she says with a laugh. “They keep saying, ‘Add a table, a chandelier, another light.’ But I want open space. When you arrive here, I want you to smell food and look out at the sweeping expanse of space.” The other items on her wish list were informed by her time in professional kitchens, from Restaurant Guy Savoy to Patina to Daniel. Optimal flow and safety were crucial, so Guarnaschelli’s oven is close to a sink. Another must-have? A duo of both sinks and dishwashers so the dishes she uses for food prep can be kept separate from the ones for serving. A wine fridge, which is filled with bottles for every occasion, doubles as a vault for fermentation; one shelf is reserved for pickles and sauerkraut. 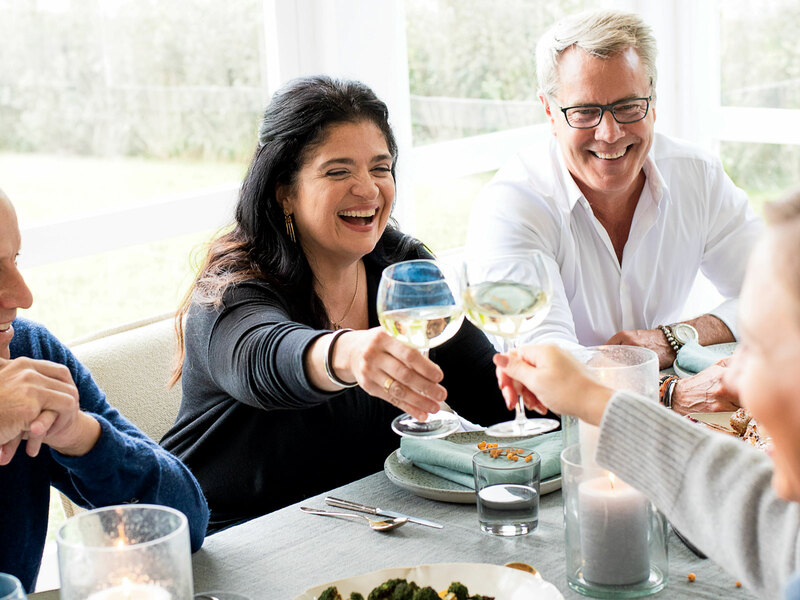 To celebrate the completion of the house, Guarnaschelli is entertaining the Hamptons-based design team—many of whom have become good friends. The group gathers around the kitchen while she juggles the pans on the eight-burner Miele stove, cooking and talking and laughing. It’s just how she planned it—the Cambria-topped kitchen island blends seamlessly into a wide oak serving buffet, and on it, a platter of gooey little grilled cheese sandwiches filled with balsamic-leek jam, alongside Guarnaschelli’s signature extra-dirty martinis. The table is set for six, and everyone makes their way to the dining room for Guarnaschelli’s juicy pork loin and roasted broccoli topped with a sautéed broccoli stem vinaigrette. Pink twilight pours in through the giant windows, warming the room. After a boisterous toast, Guarnaschelli turns her head to the kitchen and the big window over the stove. She quiets for a moment, taking it in—her space, and the light. Then she’s back to the party, to the laughter and the noise, pouring another drink, and the meal goes on. You have to outfit your kitchen with lots of outlets. I have two double outlets (above, bottom right) right in my countertop—they pop up when I push them but are hidden otherwise. If you can manage it, having two dishwashers is great. I splurged on two full-size Miele dishwashers (above, bottom left) and use one for bowls, pots, and pans (all of my prep work) and one for all of my serving dishes. My cabinets are from Bakes & Kropp (above, top right), and I’m obsessed with them. They’re made with thin wire mesh, so they’re transparent, and I’m not constantly opening them. I just scan the contents (namely, my mismatched vintage glasses) with my eyes. I wanted the sink, a Kohler 8 Degree under-mount sink with a semi-professional faucet (above, bottom left), in close proximity to the stove for access to water. I have an amazing walnut knife drawer designed by Bakes & Kropp (above, top left) where I can lay my knives so that I can easily see each one and the blades don’t touch, which helps keep the knives sharper. My wine fridge (above, bottom left) is also my vault for fermentation. I make ramp and gooseberry pickles in recycled wine bottles and stash them on a secret shelf. I have to hide them from my daughter!